The meet saw a return to the Alex McIntyre Memorial Hut at Ballachulish and got off to an early start with quite a few folk taking advantage of time on the Friday, although unfortunately the weather wasn’t as good in the west as it was in a very sunny Edinburgh. 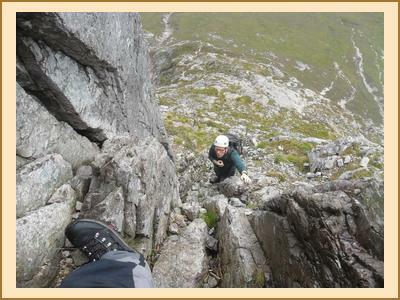 Martin and Keith climbed the aptly named Gutter Route on the Polldubh Crags in Glen Nevis with rain pouring down it. Claire H skipped over the Aonach Eagach, James climbed Curved Ridge on Buachaille Etive Mor, Ken and Chris W bagged a couple of Munros at Drumochter and Fiona M climbed one of the hills near Loch Ness. Most folk had a relaxed start on the Saturday morning while it dried up and the cloud gradually lifted to give a fine day with great views, although the lack of wind did mean the midges were out in force. Tim and James were rewarded for their early start with free hot croissants and tea at the CIC Hut before climbing Tower Ridge on Ben Nevis. Nathan and Julian were not so lucky with the croissants when they got there a bit later on, but went on to climb Raeburns Arete on the Ben once it had dried up. Claire bagged Carn Mor Dearg in record time having been chased up by midges, before heading on to Ben Nevis, leaving just 3 Munros to go. Ken and Chris climbed Stob Ban before heading further along the Grey Corries. Fiona M and Elsie headed down Glen Etive to Beinn Fhionnlaidh before going to the new indoor climbing centre in Fort William. Keith and Martin climbed North Buttress on Buachaille Etive Mor accompanied by clouds of midges. Allan, Emma, Fiona C, Pauline and Kate traversed the Ballachulish Horseshoe again joined by an army of midges on the way up. Sunday was a fine day with sunny spells and great views and fortunately no midges! After a lot of car shuffling trying to get all the cars out of the tightly packed car park, Chris and Ken headed off to Beinn Fhionnlaidh and Emma, Martin and Pauline climbed Bidean nam Bian. Allan, Fiona C and Kate climbed a couple of Corbetts at Tyndrum, and Elsie and Fiona M headed off for some more climbing. 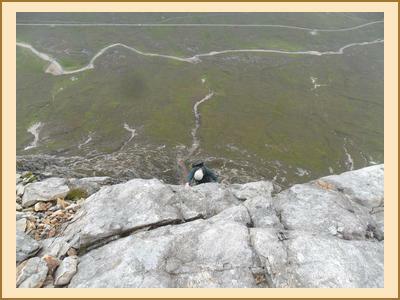 Julian and Nathan climbed the North Face and Hiccup Routes on Buachaille Etive Mor before descending down Curved Ridge. With a couple of days off work, Tim headed off towards Glenfinnan to bag some of the Corbetts there. Thanks to everyone for a great meet and their good company over the weekend.